Using 4mm okoume plywood over a skeleton of poplar, Ed Neal built PICKEREL according to Michael Alford's plans, purchased from the WoodenBoat store, www.woodenboatstore.com. 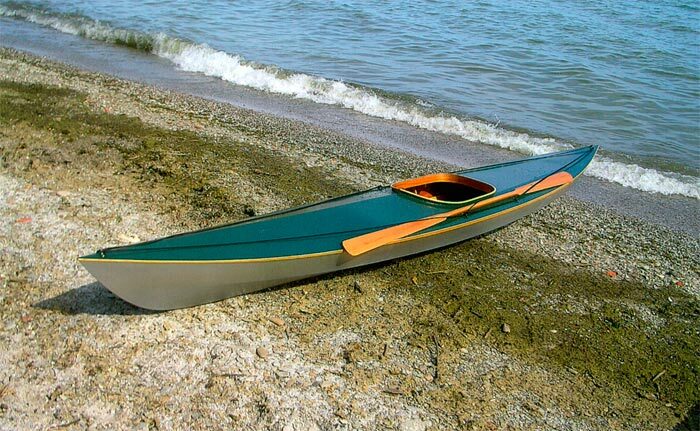 Paddling on Lake Erie can be challenging, Ed reports, but says PICKEREL can handle a bit of chop, even up to 3 foot waves. Ed plans to build a slightly modified lighter version of Tursiops next, He would like it to handle his large frame, and also be a little easier to lift. PICKEREL weighs 62 lbs.